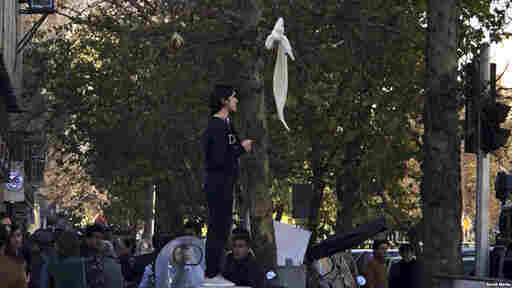 In Iran Protests, Women Stand Up, Lift Their Hijab, For Their Rights Iran is one of the only countries where women and girls must wear the traditional garment by law. These activists are breaking the rules in protest. Tension is rising between Iran and the United States these days. But Iran's leaders are facing pressure from various sides at home, too. Ordinary Iranians are mounting protests that refuse to go away, despite a sharp response from the authorities. The demonstrations began to make news late last year, focusing largely on economic hardship. As those protests continued in cities around the country, another movement re-emerged: young women standing up against the enforcement of conservative Muslim strictures on their dress and behavior. Similar protests have gone on for years, sometimes unnoticed outside Iran. Atefeh Ahmadi, a 29-year-old freelance translator from Tehran, says she was intrigued when she started seeing the resurgence of images and videos of women standing on electrical boxes in public squares and removing their headscarves. "I saw the videos and I thought to myself, this could do some good if it's an ongoing thing," she tells NPR. So one day, she tried it herself, and the video and photographs of her went viral on social media. Then on March 8 — International Women's Day — she tried a new kind of protest. ویدیوی دریافتی: "#سرودبرابری، عصر امروز، متروی حقانی. "Me and two of my friends went to the subway," she says. "We sat in the women-only car and sang a well-known feminist song. We also handed out pamphlets promoting women's rights." In the song's chorus, the trio repeated the words: "I am a woman." Ahmadi says they were almost arrested that day but managed to escape. The protest drew attention and, after she was publicly identified in a documentary as one of the participants, she chose to leave Iran for Turkey later in March. Meanwhile, the protests continued and spread beyond the headscarf. Women posted videos and images of themselves singing and dancing, which is prohibited under Iran's strict version of Islam. A Facebook page called "My Stealthy Freedom," started in 2014 by New York-based Iranian activist Masih Alinejad, features photos and videos of women defying Iran's headscarf law. Facebook and Twitter are banned in the Islamic Republic, but many Iranians access the social media sites through private online networks that mask users' locations, ducking the censors. Other popular platforms like Instagram have also been blocked temporarily from time to time — "to keep the peace," according to authorities. Offline, the government has responded to the protests by cracking down, including a series of sweeping arrests on university campuses that was documented recently by Human Rights Watch. The demonstrations have gained international attention, including among senior Trump administration officials. Secretary of State Mike Pompeo has spoken out and the State Department has tweeted — in Iran's Farsi language — in support of Iranian women's rights. 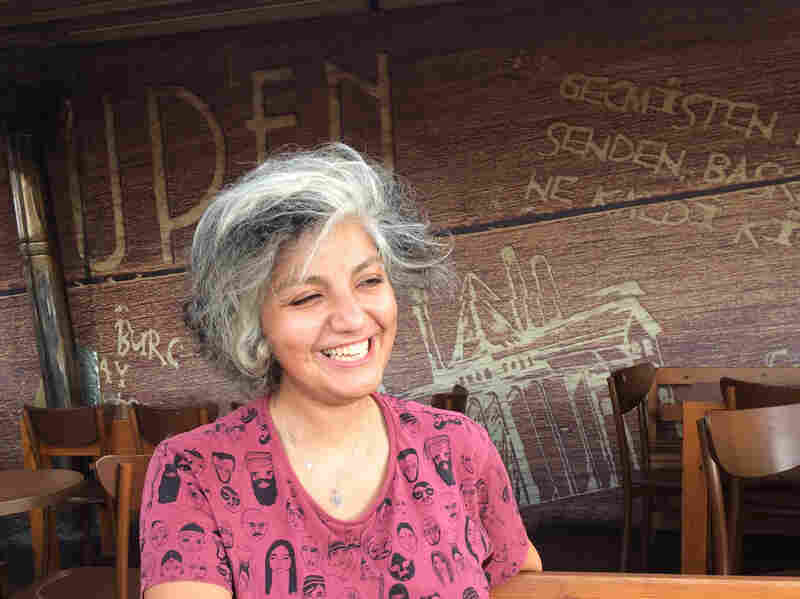 Atefeh Ahmadi, a 29-year-old freelance translator from Tehran, lets her hair show in Turkey. She fled Iran after staging protests for Iranian women's rights. Ahmadi says she supports all the various protests. But for her, it's taking on — or taking off — the mandatory hijab, a headscarf and other modest garments, that's important. "Some may want to focus on other hardships," Ahmadi says. "The demands may seem diverse, but I think the ultimate point is to end the rules on hijab." Under Iran's strict interpretation of Islam that's melded with government since 1979, women and girls over the age of 9 are required to cover their heads and everything but the face and hands. Offenders face fines or jail time. During a period last century, Iran and various other Middle Eastern countries had banned the hijab. Nowadays, many places have a strict dress code for women. But Iran is one of the only countries where the penal code mandates it. Ahmadi says although the women's protests are less visible in the media these days, people are still defying the law to keep the issue alive. "There was no specific positive reaction from the government, in terms of making a positive change in laws against women," she says. "There was only a series of arrests and prosecutions." In late 2017, police said they would stop arresting people for dress code violations. But harassment of women by the "morality police" continued. Ahmadi says public awareness of the issue has grown, however. Some of the arrested women were forced to make televised confessions, which Ahmadi says only incensed the public more, and generated more debate around the issue. Despite the generally hard line taken by the authorities, Ahmadi believes the protests have gained momentum, and won't stop until the government addresses the fundamental problem. "Because it seems that the state has a problem with women's bodies," she says. "Everywhere that a woman's body is involved, there will be a reaction from the state. And that will spark more protests." Journalist Bijan Sabbagh contributed reporting to this story in Istanbul.